The Keen Newport sandal is a well adored water shoe that is mainly purposed for hiking, walking, and for all of your travel adventures. Keen Newport sandals are over loaded with very distinct features and are oozing with design appearances that allow for them to keep the present day style as well as applying those features that they are built for. Come to our store to browse our selection of our extremely comfortable, durable, stylish and long-lasting Keen Newport sandals. Keen is an American footwear company that was founded in 2003 by Martin Keen and is currently based out of Portland, Oregon. Keen makes shoes that highly encourage an active outdoor life, and service your feet while doing so. Keen Newport is also remarkably proud to inform you that we have been awarded the high honor of being recognized as one of the top eight best hiking sandals of 2018 by the Adventure Junkies! 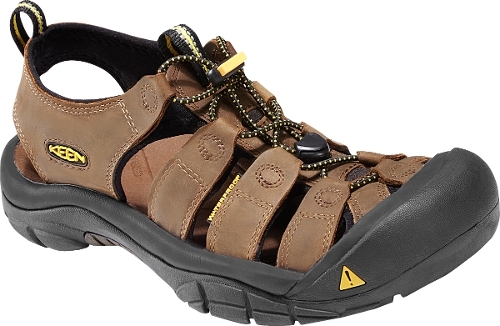 Keen has succeeded in making outstanding hiking sandals while also being a comfortable open and airy sandal. On the very top of the sandal is a durable and sturdy waterproof leather that makes this shoe perfect for all outside activities. The footbed accommodates to the shape of your foot to provide the ultimate fitted comfort. The rubber toe offers exempt security of your toes for any and all adventures in and out of the water. Keen Newport sandals exterior framework allows for protection of your feet for many different types of outdoor conditions and areas. We look forward to seeing you at 3 Center Square Greencastle, PA to help you look for your perfect pair of Keen Newport shoes that fit your wants and needs. Or please feel free to enjoy our fast shipping with our online shopping with the brands that you know and trust!